You'll be £24.00 closer to your next £10.00 credit when you purchase British and Commonwealth Warship Camouflage of WW II – Vol 3. What's this? During the Second World War navies developed low visibility camouflage, applied to both the vertical and horizontal surfaces of their ships, in order to reduce visibility by blending in with the sea, or confuse the identity of a ship by applying obtrusive patters. In this volume by maritime artist Mal Wright, all the paint schemes that adorned the cruisers, minelayers and armed merchant cruisers of the Royal Navy and Commonwealth are depicted in detail, along with discussion on changes of armament and electronics that effected the outward appearance of each ship. Beginning with the older cruisers, the book goes on to cover all the other cruiser classes taking in heavy cruisers, prewar cruisers, prewar and wartime cruisers; a large part also covers minelayers and armed merchant vessels (AMCs). Where possible both sides of the ship are depicted. With 800 full colour illustrations, arranged by ship type rather than camouflage scheme, this book concentrates the clearest possible information into a single volume to provide a one-stop reference source. Many schemes would be difficult for any reader to unearth other than with the most intensive research, so this work is an invaluable tool for historians, collectors, modelmakers and wargamers. This is an essential reference work containing an immense amount of information for both ship modellers and anybody with an interest in the subject. It is currently on offer. I recommend it. Broadly speaking the books on academic’s shelf will split into three categories, the highly academic, the good general work and the specialist reference. This book certainly fits it the latter, but it does it so well that even though it could have come across as disjointed or terribly sectional, instead it actually is nice to read. This is a book which whilst should be on every academic who studies navies in WWII book shelf, it should also be on anyone who is just interested in that period’s shelves as well. 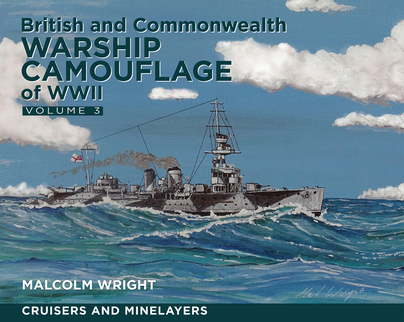 Overall this series has given fresh insight into the wide range of official and unofficial camouflage schemes worn by Commonwealth warships during this period and volume 3 is a valuable addition. Malcolm Wright is to be congratulated for the painstaking care and research that has so obviously gone into this book since there are few accurate records of what a camouflaged warship actually looked like in the era before affordable, digital coloured photography. It is firmly recommended for anyone with an interest in the warships of this period and especially for model-makers. ... The disruptive liveries feature stunning colours, and each vessel's drawings are accompanied by informative texts, with colour codes quoted...and advice on re-fit equipment. This is a splendid series, superb for any maritime modeller. at any period of their service career. The book is intended as a quick reference source for historians, collectors and model makers, but it will also appeal to a wider audience. find this unique reference source invaluable. Highly recommended. This is the third volume in Malcolm Wright’s series on the camouflage schemes adopted by the Commonwealth navies in World War II and it is, arguably, of the most interest to Australian readers since it includes the RAN heavy, light and armed merchant cruisers of the period. Wright is a well-known Australian maritime artist and war game designer who has spent a lifetime gathering material from archives, contemporary paintings, photographs and the recollections of veterans. The book is in colour throughout with a chart at the beginning which identifies specific paint colours and identifications, such as Admiralty 507b medium grey, which appear on a variety of ships throughout the book’s 192 pages. Each ship is depicted with a number of port or starboard-side elevations, a grand total of over 700, which show them at different stages of their lives and, where applicable, ships shown as they appeared before and after the war. In some cases there is an overhead view to give the colour of decks, turret roofs and other features. HMAS ADELAIDE, for instance, is depicted as she appeared in 1922, 1939, 1940, 1941-42, 1943-44 and 1944-45. Each drawing is accompanied by notes that explain changes in the ship’s appearance after modernisations, refits and changes in armament and equipment. The result is a most useful compendium of detail that not only tells the reader what an individual ship looked like but how details of its armament and sensors changed over time. The book is divided into sections which include old cruisers, Treaty heavy cruisers, pre-war Treaty light cruisers. WWII-built cruisers and finally minelayers and armed merchant cruisers. RAN cruisers feature in most of these sections with a total of 10 ships described. AUSTRALIA has 13 drawings spread over 3 pages each with its own notes. The bulk of the ships are RN but many of these were a familiar sight on the Australia station and due attention is also paid to the smaller number of cruisers that served with the RCN and RNZN either on loan or purchased outfight. Usefully the author has continued to describe ships that were sold to other navies including those of Poland, China, India, Pakistan and Peru, thus showing an aspect of their lives that has not previously been adequately covered. Overall this book gives a fascinating insight into the wide range of official and unofficial camouflage schemes worn by Commonwealth cruisers during this period and Malcolm Wright is to be congratulated for the painstaking care and research that has so obviously gone into this book. In the era before affordable, digital coloured photography there are few accurate records of what a camouflaged warship actually looked like during the war years. This book goes a considerable way towards filling that gap and the author is to be congratulated for it. It is firmly recommended for ship model makers and anyone else with an interest in the warships of this period. I cant really find the words to do volume 3 justice. Like the previous two volumes its packed full of information essential to anyone with a serious interest in the British and Commonwealth fleets of the period from 1919 to the end of WW2. Mal has packed in so much information its hard to understand where he found it all and made to time to do it. All three books in the series will become essential reference sources for the camouflage carried in WW2. Excellent addition to the series! Many color paintings of these smaller vessels based on meticulous research, analysis of B&W photographs and period documentation. Love it Mel, keep up the great work. Amazon Customer 5* Review, Mark G Mod. Outstanding resource, artwork is extraordinary. This is the third part of his titanic work dedicated kamuflażom Royal Navy and the British Commonwealth in the years of World War II. The third part is devoted entirely cruisers, stawiaczom min and auxiliary cruisers. I admire the author for the huge effort you put in the work, which should be in my opinion, on the shelf of every ship lover. Below a handful of images. The author does not forget about the two Polish cruisers Dragon And Conrad - respect! For me, at this book it has more value that I have received a copy autographed by the author. Mal - thank you very much! You have done it again, but even better! I take my hat off to you for tackling this subject so comprehensively. THANK YOU! "Thank you" for a great job on this series of books (all three volumes)! Really outstanding work and presentation! A work essential for both historians and modellers or players of naval wargames. This makes another great addition to your references if you are a ship modeller in particular, as so many of these are available in kit form these days. When you see close up they look quite extreme in some cases, but when seen at the ranges experienced at sea, how these patterns would have broken up the outline and appearance of a ship to an enemy observer is remarkable, perhaps enough that they come within range of attack before they can take avoiding action. Another excellent reference.